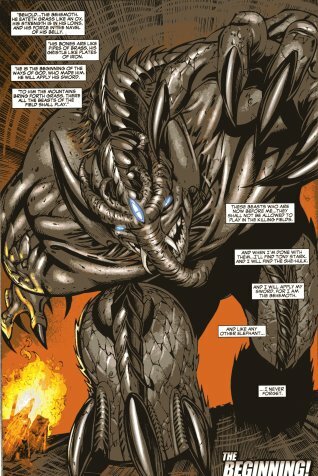 Powers/Abilities: Mystically augmented by Seetorak (possibly an alias for Cyttorak), the Behemoth has the humanoid powers of an elephant including superhuman strength (at least Class 100), stamina, resistance to harm and the think hide of an elephant including the ability to shapeshift beftween his human and superhuman forms. 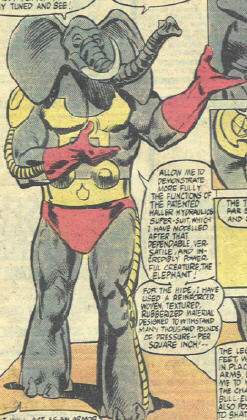 Man-Elephant wore a battlesuit that mimicked all the traits of elephants plus other traits. The exterior was a reinforced rubberized material capable of withstanding many thousands of pounds of force per square inch. The detachable tusks could be used as retractable grappling hooks and withdrawn by an interior winch. It could augment its wearer's strength to snap iron bars (Class 25) with hydraulic pressure. The trunk had the tensile strength of spring steel and odor ampifiers as well as sonic and gas emitters. The legs could allow him to withstand objects in motion as well as shatter rock. Within the ears was an audio system designed to detect most sensitive noises. History: (Savage She-Hulk#17) - Manfred Haller was the owner and designer of Haller Hydraulics, boasted as the world leader in innovative hydraulics. Having designed a powerful suit for companies to explore hostile areas, he offered a chance to prove its worth to Sheriff Morris Walters by capturing the She-Hulk. Haller hoped the publicity would be enough to endorse the suit. Drawing the She-Hulk into action, the Man-Elephant proved to be more than a match for the jade giantess, but once the She-Hulk's believed crimes were found groundless, the Man-Elephant backed off realizing his suit also had the potential for enormous abuse. (Civil War: Battle Damage Report) - Tony Stark considered Haller as a potential Initiative recruit. (She-Hulk II#25/2 (fb) - BTS) - Manfred Haller was put out of business by Tony Stark, and his assets were frozen. He traveled to Timbuktu. (She-Hulk II#37) - As the Behemoth, Heller tracked the She-Hulk down for revenge based on slights to his ego he percieved. He discovered her working as a bounty hunter with her RV parked at a rest stop in New Jersey. However, at the time, the She-Hulk was in goverment custody after participating with the Liberators in ousting the corrupt government of the country of Marinmer. In her absence, the She-Hulk's partner, Jazinda, a shape-shifting Skrull, impersonated her and took a beating from the Behemoth that left her unconscious. (She-Hulk II#38) - Keller turned over Jazinda to the government who placed her in a military medical facility for study. Lurking around in human form in case the She-Hulk showed up, Heller attacked her as the Behemoth and was attacked in turn by Thundra coming to her defense. In the confusion, Jazinda gisguised as the Behemoth escaped as the real Behemoth was defeated by the She-Hulk. (X-Factor III#240) - Strong Guy fought Behemoth in New York City and their battle led them to main switching station. Strong Guy defeated Behemoth by knocking him into the relays at the switching station, causing a blackout in NYC. Comments: Created by David Anthony Kraft and Ed Hannigan. Notably, Haller backed off when he realized the destructive power of the suit. Conceivably, a more than crooked person could turn the suit into a chance for personal gain. According to David Anthony Kraft and Ed Hannigan created Man-Elephant. Hannigan provided a character sketch of Man-Elephant on one of his trips to Screamer Mountain which was sent to Vosburg with the plot. Several things in the She-Hulk series paralleled Spider-Man from Gwen's death to the She-Droid (Spider-Slayers). 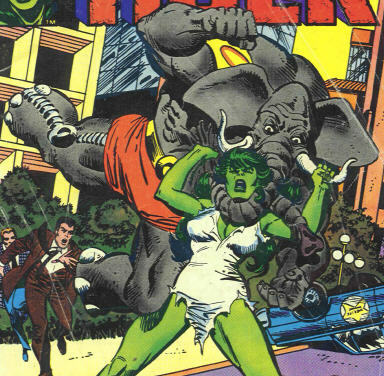 The Man-Elephant could be the She-Hulk's counterpart to the Rhino. I'd make some joke about Pachyderms of the World uniting, but , alas, there is already a team, the Power Pachyderms.